Jun - 11 | By: J Bills | no comments. The role of “FX Artist” working on a film is a fun one indeed. FX Artists are tasked with creating dynamics and particle animations that create flashy effects like explosions, psunami level tidal waves, smoke, buildings crumbling, and other such epic imagery that make summer blockbusters all the more fun. 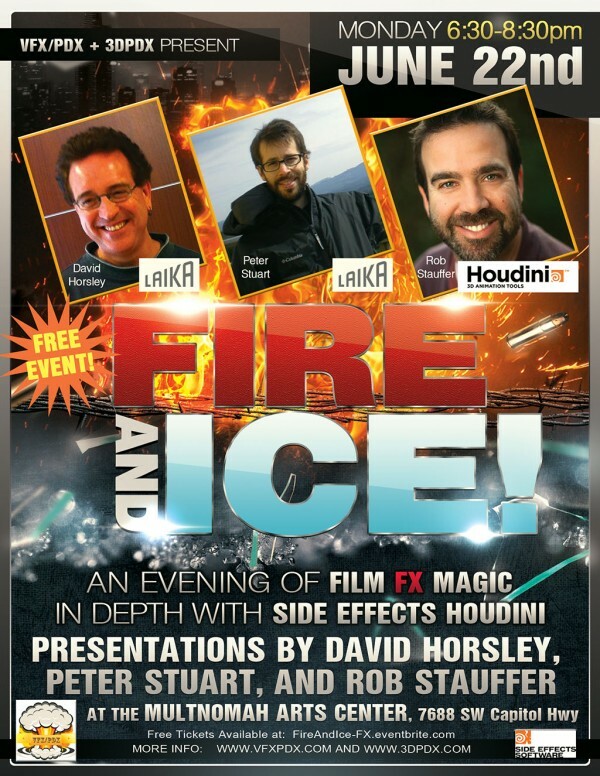 We’ll have 3 such individuals presenting at the next VFX/PDX meeting, which will heavily feature their weapon of choice: Side Effects Houdini. Portland, it’s time for a night we’re calling FIRE & ICE! Woo ha! David Horsley is a recent arrival at LAIKA and the Lead FX Artist on the upcoming film Kubo and the Two Strings. As that is still in production and shrouded in secrecy, David will be showing work from his past projects, including Life of Pi, Enders Game, and the most recent installation of the Spiderman franchise. Also joining us from the ranks of LAIKA is long time Technical Director Peter Stuart, who has been part of many a successful sequence within LAIKA films, dating back to Coraline. Peter speaks fluent “computer” and is usually tasked with special ops that showcase his uncanny ability to code his way out of a jam when something seems impossible using traditional means. Peter will be showing breakdowns from LAIKA’s most recent film, The Boxtrolls. Up from LA is Side Effect’s Senior Product Specialist Rob Stauffer, a former FX Supervisor who will be showing off all of the new toys in Houdini 14. A very special thanks to Side Effects for sending Rob, helping to put this night together, and making it a rare can’t-miss event. All of this takes place Monday, June 22nd, from 6:30-8:30pm at the Multnomah Arts Center auditorium, in the Multnomah Village neighborhood.